“A project I have done in my spare time. 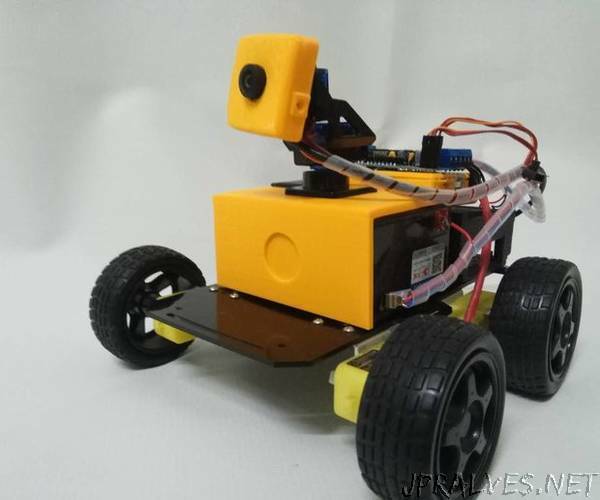 It is a full-drive 4 wheel robot controlled through a web interface. If you have any comments or questions please feel free to contact me. This project itself uses 3D printed parts and certain pieces of code that were created by other people. You can find credits and have a look at the original pieces at the end of Instructuble. Here’s the list of components I used with the links and the alternatives. I live in Shenzhen, China and I bought the parts directly on Taobao. Arduino Uno clone Alternative: You can use any other Arduino board without significant changes to the code. 6V 4.5Ah Pb battery Alternative: It is possible to experiment with smaller LiPo batteries if you want lighter robot/use only two motors. Banana Pi Alternative: Can swap for Raspberry Pi 1/2/3 or Orange Pi without significant code changes. I used Banana Pi only because I had one lying around. Camera Pan/tilt mount with sg60 servos Alternative: 3D Print tilt/pan mount for example can use this one.